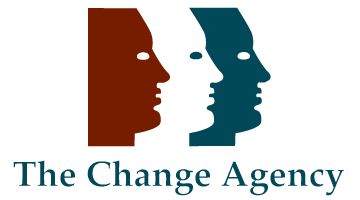 For over 20 years, The Change Agency has enjoyed an outstanding reputation for Leadership Development, Executive Coaching, Cultural Renewal, and Team Excellence. Each of our consultants is a change agent – educated and experienced in the science of teaching and the psychology of how to change. Our emphasis is on people changing old habits and doing new things. We are about growing adults to their full potential – for the benefit of themselves and the organisation. In essence, this means we enable people and teams to convert their hopes into real results. Jane is always described as a truly charismatic teacher. Her words and wisdom seem to touch people at a heart level – inspiring new beginnings, new journeys. As a coach, she is a great partner for the exciting, but sometimes lonely work of being and becoming a “real” leader. 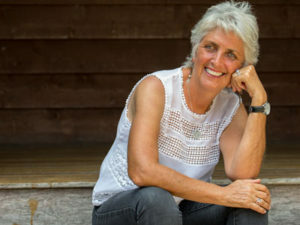 Jane Downing holds a Master’s Degree in Organisational Change as well as a Higher Degree in Counselling Psychology and a Degree in Education. 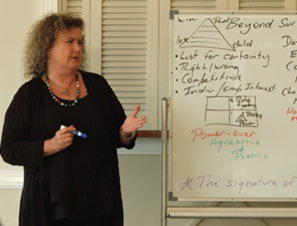 For over 20 years she has been the Director of The Change Agency Pty Ltd, a management consultancy specialising in culture change for organisations and personal and professional development for the individuals within them. 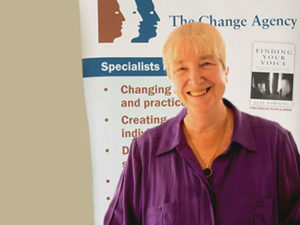 Her book “Finding Your Voice” published by Allen and Unwin, continues the pervading theme of her work which centres around leaders and managers assuming responsibility for engaging with people and opportunities and then operating in ways which respect differences and collaboratively solve problems for the common good. She also lectures at the Queensland University of Technology in the Faculty of Business and at the School of Public Health. Jane firmly believes that many of us are frustrated by the systems and structures that we work and live within and that renewal is critical for the individual as well as the organisational and community whole. Her work has always emphasised personal growth as the way to professional excellence. Joan Wilson-Jones has been lifting organisations by ‘inspiring its people’ for some decades now. Both from an internal focus as a successful senior manager and from an external perspective as a consultant. With over 3 decades of diverse experience to draw on, having managed successful teams in areas from tax compliance to community services, Joan’s work in training and coaching is well supported by a practical background and a solid and relevant educational journey. Highly sought as a presenter, speaker and coach in areas of leadership, change management & workplace cultural change, workplace feedback, conflict management, cultural interactions, supporting staff with mental health issues, happy/healthy workplaces and health & work life balance. Joan holds a Master of Education (Adult and Workplace Education) from the Queensland University of Technology and a B.A. in Cultural Studies from Griffith University Queensland. She has studied concepts of Core Energy Management with Dr William Bloom in Scotland and attended workshops in life transition and dealing with change in New York. She is an accredited MBTI (individual personality indicator) and MTR-I (teams profile indicator) facilitator, a level 2 Reiki practitioner, an accredited 1:1 Heartmath provider and an accredited PSYCH-K facilitator. Jenny Brown is an Associate Professor of Medicine and a Practicing Clinician with interest in both mainstream medicine and the effects of mind and spirit on health. Throughout her career she has been a clinical teacher developing and teaching programmes for both undergraduates and physicians in training. She was Chief of Medical Staff at the Mater Health Services on an Executive managing 3,500 staff and providing half a million occasions of service per year. Jenny wrote a corporate plan for the Mater Health Services and undertook a major culture change strategy winning the Telstra Queensland Business Woman of the Year. Her first love is clinical medicine but she sees great similarities between managing a patient and managing an organisation. 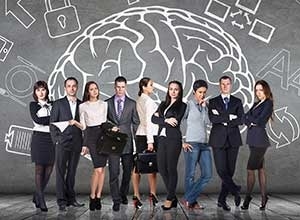 For over 20 years, The Change Agency has had an excellent reputation for developing individuals, teams and organisations. At The Change Agency we offer a range of services designed to meet the needs of clients from the full range of industries. We meet with prospective clients to discuss the full range of options for working together. Please browse our range of Training Courses to see how our experienced consultants can work with your organisation. Click here to see our extensive client list and browse our testimonials to hear feedback from our clients. We look forward to an opportunity to meet with you to discuss the needs of your organisation. Please contact us by sending us an email changeagency@optusnet.com.au or call us on (07) 3366 1779 to discuss your needs further. Aren’t all training programs the same? On the surface many leadership and teamwork programs appear similar. That is because the topic areas appear superficially the same. Nothing could be further from the truth. Topics can be copied, it is the process design and skill of the teaching used that cannot. What am I thinking about and remembering from this course? What am I applying and doing differently at home and at work? What results am I achieving for myself and others? Good teachers/change agents insist on personal reflection followed by action. This is the opposite of “Training Courses” which focus on topics covered and presentation. Powerpoint slides, amusing trainers and group discussion does not result in personal or professional change. Training took place – learning did not.